Remjie Malham has brought us an epic two-off lottery this weekend! Remjie’s characters Toratora and Doro Kaiju are painted in “Blue Raspberry” a colour scheme with a slight purple to blue ombre. The design, scuplt and paint were all done by Remjie herself giving these two their unique charm. The pink highlights painted over their fur with the detailed dotting on their lips and Doro Kaiju’s nails are beautiful and eye-catching. On top of the detail in the paint, the heads articulate, as well asDoro Kaiju’s arms. These two are sure to look absolutely amazing on display! 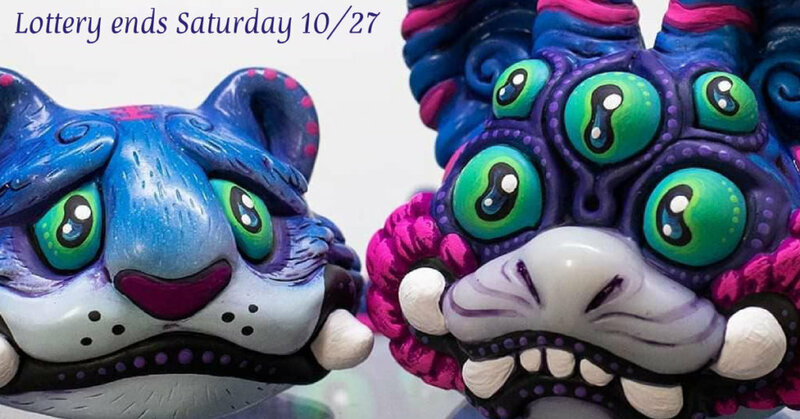 Toratora will be $250 USD (194.80 GBP) while Doro will sell for $400 USD(311.68 GBP) ; both amazing prices for these hand-painted buddies. After you email Remjie, be sure to head over to her Instagram and check out her work and follow her to be sure you get his newest updates!!! Mom, Collector, Student/Soon-to-be-teacher, writer, and world-class skee ball shark :P . I have loved the designer toy world ever since I first fell into the marvelous rabbit hole and now I am gloriously lost in the world of fantasy, imagination, beauty, and mystery.